The BAT Centre and the Punny Monkey presents Kamz Govender. The 1 liner King of Durban takes the stage for his first solo show called The Punny-sher. Kamz Govender has travelled all over South Africa with SCC Comic of the year Calvin H Goldstone. 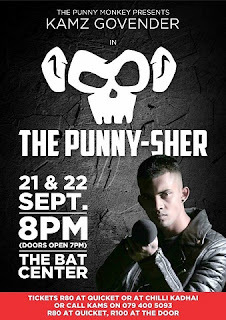 The Punny-Sher can be seen at the BAT Centre on September 21 and 22, 2018, at 20h00. Tickets R80 @Quicket or R100 at the door.